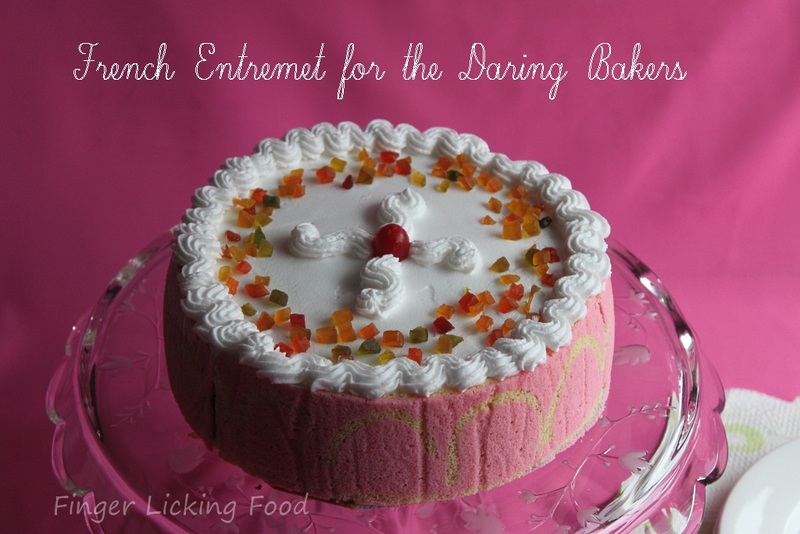 "The January 2011 Daring Bakers’ challenge was hosted by Astheroshe of the blog accro. She chose to challenge everyone to make a Biscuit Joconde Imprime to wrap around an Entremets dessert." A joconde imprime (French Baking term) is a decorative design baked into a light sponge cake providing an elegant finish to desserts/torts/entremets/ formed in ring molds. A joconde batter is used because it bakes into a moist, flexible cake. 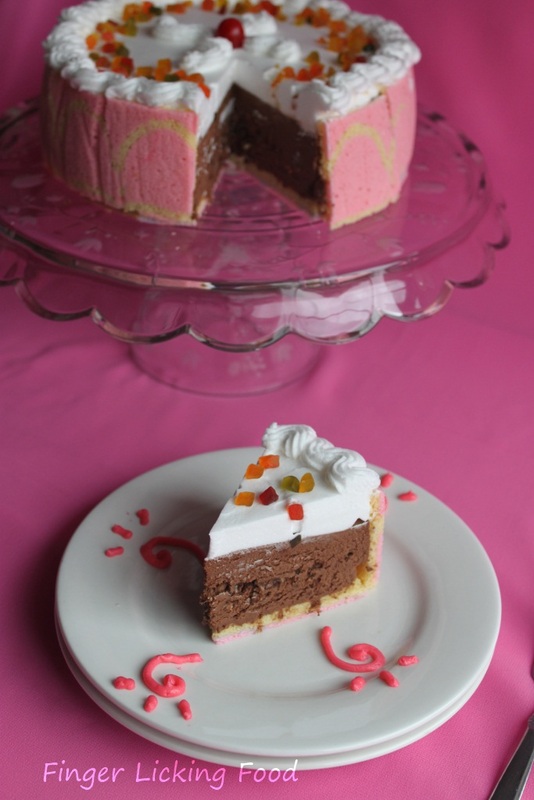 The cake batter may be tinted or marbleized for a further decorative effect. 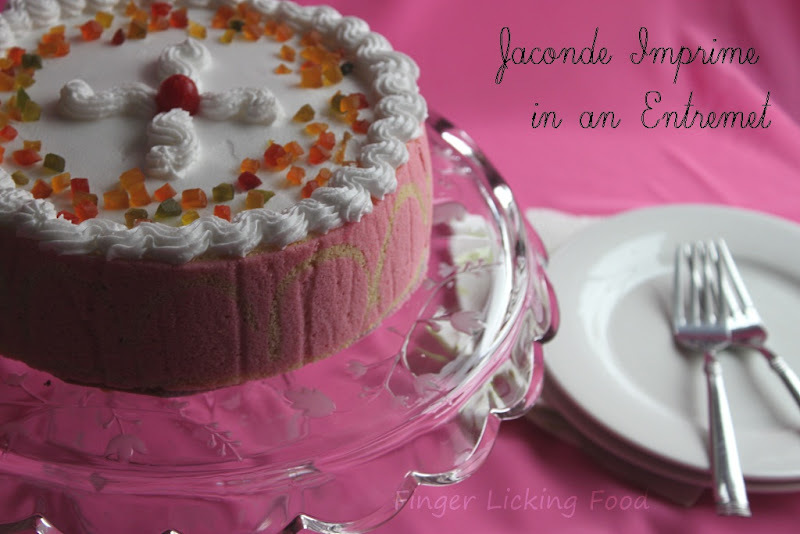 A joconde imprime is the outside cake wrapper of the Entremets dessert. Mandatory Items: Make the full biscuit joconde imprime, cut and fit into a dessert mold. Complete entremets. Variations allowed: Use the recipe provided for the Joconde. I have baked it many times without problems. Use any fillings for your entremets. Use a mold. You can use store bought fillings, to save time, or make homemade. The real task here is making the joconde wrap properly in a beautiful molded dessert presentation. Preparation time: This is difficult to guess at. This time will vary. Entremets portion will vary depending on your fillings. Fold in melted butter. Reserve batter to be used later. Cream butter and sugar until light and fluffy (use stand mixer with blade, hand held mixer, or by hand) Gradually add egg whites. Beat continuously. Fold in sifted flour. Tint batter with coloring to desired color, if not making the cocoa variation. Trim the cake of any dark crispy edges. You should have a nice rectangle shape. Decide how thick you want your “Joconde wrapper”. Traditionally, it is ½ the height of your mold. This is done so more layers of the plated dessert can be shown. However, you can make it the full height. Make sure your strips are cut cleanly and ends are cut perfectly straight. Press the cake strips inside of the mold, decorative side facing out. Once wrapped inside the mold, overlap your ends slightly. You want your Joconde to fit very tightly pressed up to the sides of the mold. Then gently push and press the ends to meet together to make a seamless cake. The cake is very flexible so you can push it into place. You can use more than one piece to “wrap “your mold, if one cut piece is not long enough. The mold is done, and ready to fill. I used a Dark Chocolate & Orange Mousee(Eggless) and a Rice Krispie insert just to add another layer in between. Melt the butter and chocolate over a double boiler. Stir until smooth. Add the rice krispies and combine to coat well. Place mixture between two pieces of wax paper and roll into a thin disc, the size of your mold. I made a 7 inch disc. Chill 1 1/2 cups whipping cream in refrigerator. Chill metal mixing bowl and beaters in freezer. In a heat proof bowl on top of a double boiler, combine chocolate and butter. Melt over barely simmering water, stirring constantly. Cool slightly. Pour remaining 1/4 cup whipping cream into a metal measuring cup and sprinkle in the gelatin. Allow gelatin to "bloom" for 10 minutes. Then carefully heat by swirling the measuring cup over a low gas flame. Do not boil or gelatin will be damaged. Stir mixture into the cooled chocolate and set aside. In the chilled mixing bowl, beat cream to stiff peaks. Stir 1/4 of the whipped cream into the chocolate mixture to lighten it. Fold in the remaining whipped cream in two doses. There may be streaks of whipped cream in the chocolate and that is fine. Do not over work the mousse. Transfer mousse to a large piping bag. Pipe about halfway into prepared dessert mold. Press rice krispie insert into centre. Pipe remaining mousse and make the top even using a spatula. Refreigerate for 2-4 hours. 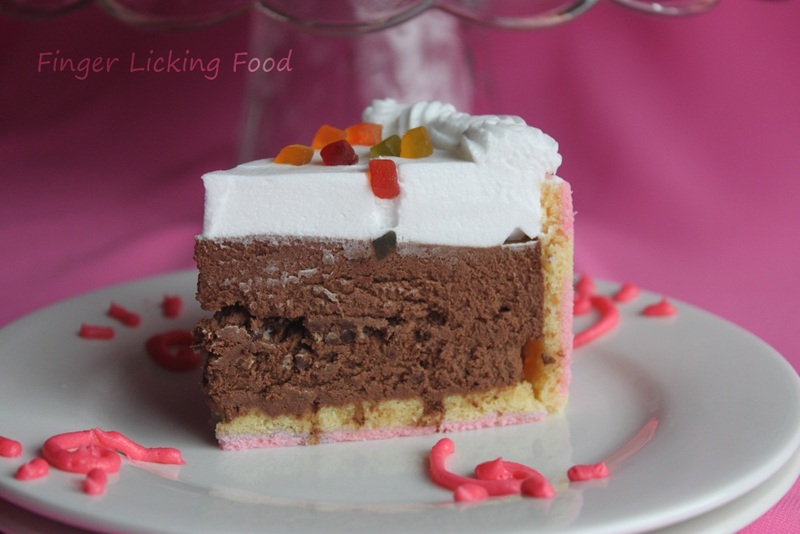 Whipped Topping: I used a light whipped topping and covered the mousse with it. 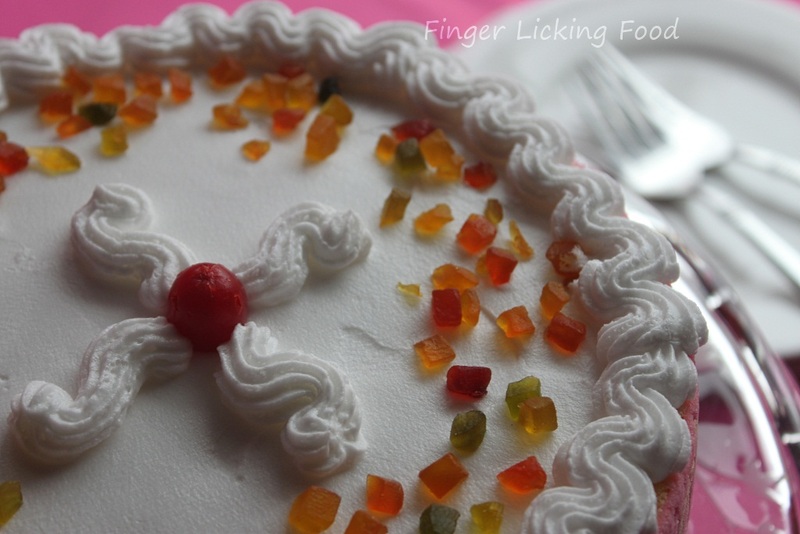 Decorate the top with cherries and tutti frutti. Once the dessert is well frozen, loosen the clin wrap around the pan. Slowly lift the pan (outer ring) to unmold your free standing dessert. Slice using a knife run through hot water and wiped dry. Looks like all the hardwork paid off well! Thats one pretty awesome cake! Oh, that is really pretty and so fresh looking. I could stick a BIG fork into that dessert and be in heaven. I love the plate design too. What a showstopper of an entremet, and your joconde is beautiful in it's'pinkety'. Love the candied topping, and the decor is just lovely. Beautifully done in so many ways! YOur entremet looks perfect, very professionally finished. This looks gorgeous! Great job on this challenge! They look absloutley yumm and beautiful. 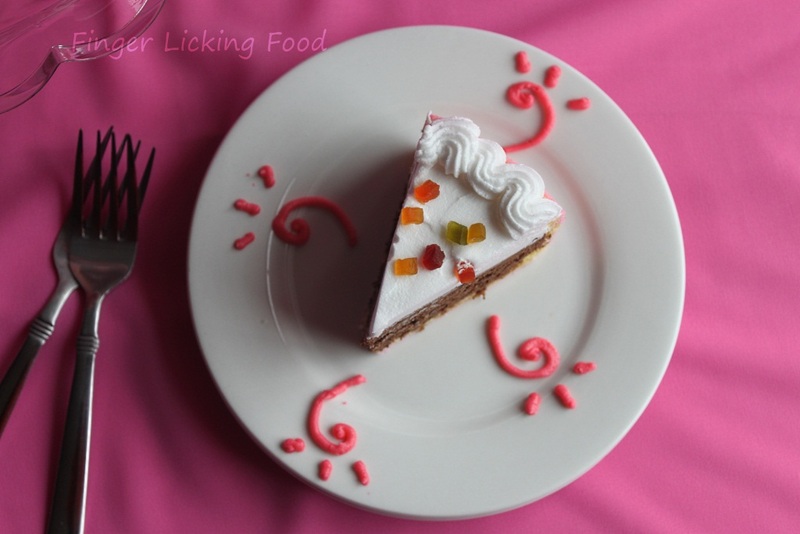 Your Entremet is so elegant, looks like a dessert from a foodie magazine! Stunning presentation! Nicely done! 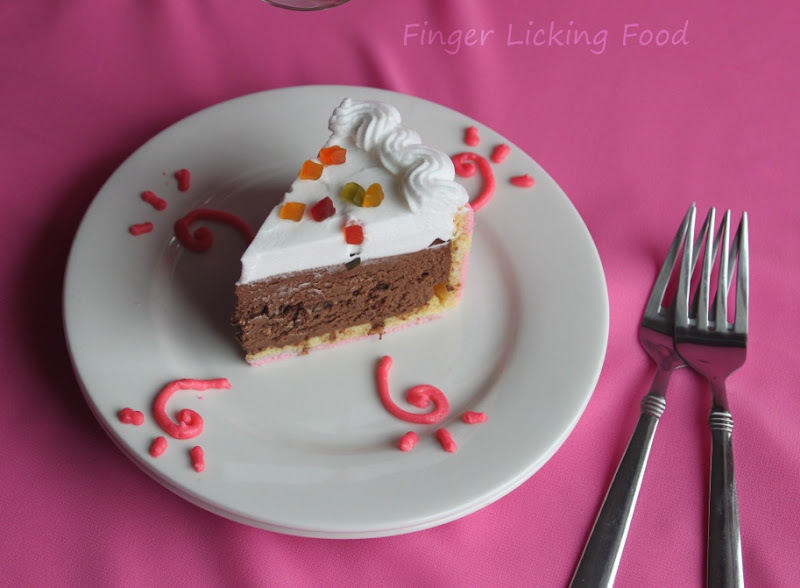 Chocolate and orange together is one of my favorite combinations! Wow! That looks so good.. pretty pretty and i bet the mousse was delicious.